Oh man, have I got a new lunch for you. Disclosure: This post is sponsored by Angelic Bakehouse. Thanks for supporting the brands that make DK possible. When I went vegetarian for the first time back in high school, the options for meat-free sandwiches were almost non-existent. I rotated between PB&J, cheese with mustard and sometimes spinach and hummus (when we could find it! Remember, this was still 2001.) Sigh, the plant-based movement has made a lot of in-roads since then, but a good vegan sandwich still eludes most cafes and bakeries. I’m fresh off the plane from LA and feeling very invigorated with delicious vegan eats. That’s the best part about the West coast; so many incredible vegan options to choose from, I can’t help but plan my trip around which restaurant I want to eat at first. Thankfully, BL is always game and we tackled quite a few new spots to come home happy and belly-full of tempeh, curries and coconut ice cream. That trip inspired this sandwich, a love letter to my high-school days. 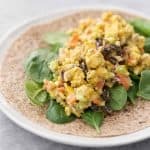 A plant-based wrap that I didn’t know existed and feels light years away from the tired PB&J or hummus and veggie. This one has curried mayo, spiced tempeh, sweet raisins and crunchy sunflower seeds. 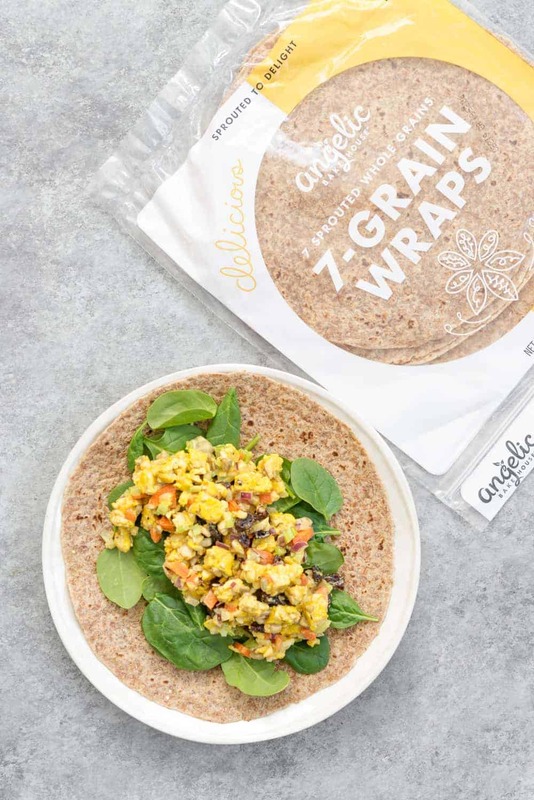 Delicious on it’s own and even better wrapped in an Angelic Bakehouse Sprouted 7-Grain wrap. Have you had these wraps yet? We first grabbed them a few months ago and have fallen in love with their yummy, nutty taste. I often hear that clients aren’t interested in eating ‘healthy’ because they think that means compromising on taste. Not with these wraps! Even though they are made from sprouted grains, they taste so delicious and are the perfect mash of wholesome and awesome. If an 18-month-old goes crazy for them, then you know they are good. 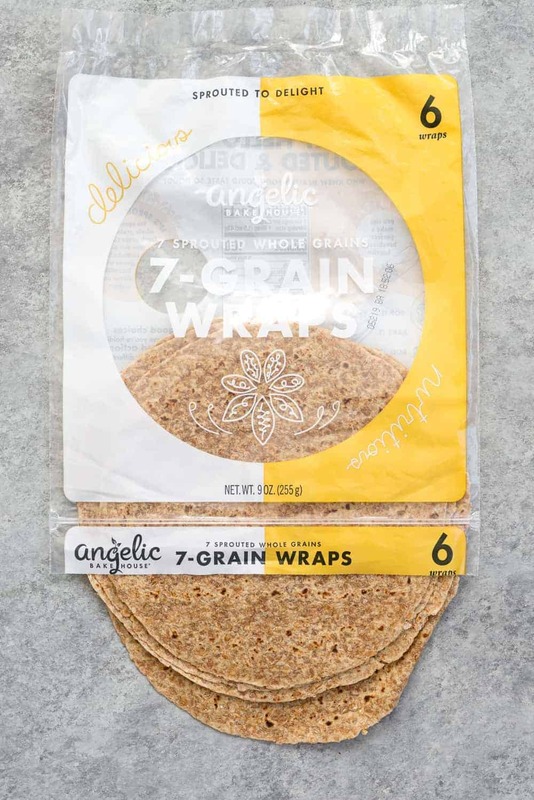 Their sprouted 7-grain wraps use non-GMO whole grains and all of their red wheat berries are certified chemical- and pesticide- free. I like that, especially as I’m serving not only myself but Vander as well. I love that all of Angelic Bakehouse products are kosher, 100% vegan and free from high-fructose corn syrup, refined sugar and GMO’s. Using sprouted grains is a good thing, especially for fellow plant-based babes. When a seed turns into a sprout, it increases the levels of B vitamins, fiber, essential amino acids and increased bioavailability of certain minerals, like zinc and iron. Sprouted grains are usually easier to digest than other grains, and they have a reduced glycemic index. 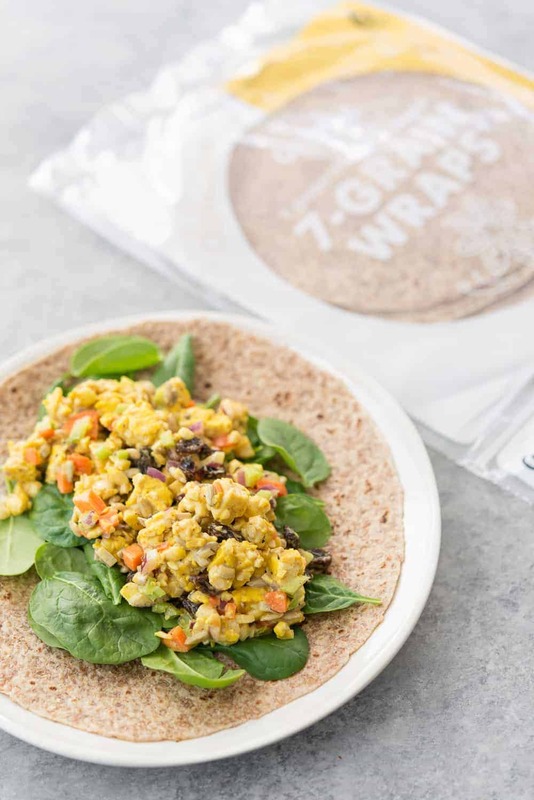 The other good news about this vegan curry tempeh salad wrap is that it packs well for lunch on-the-go. 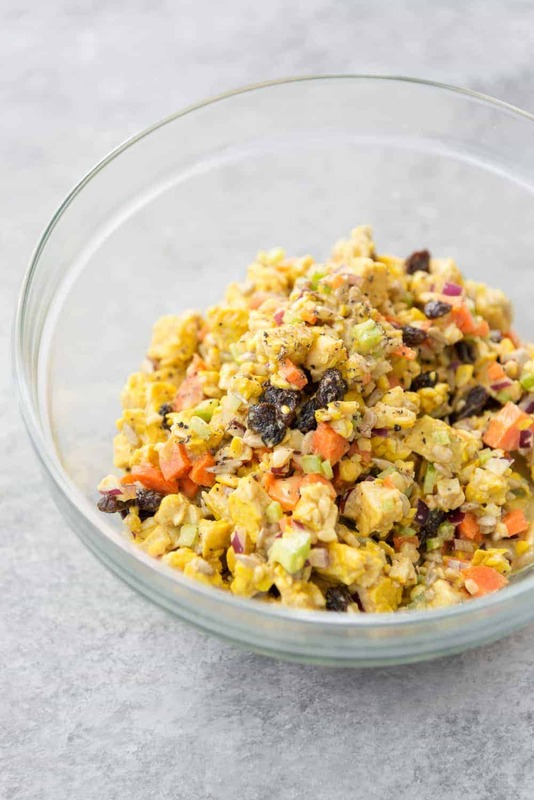 Make the curry salad ahead of time, then pack with you a few scoops and your wraps! Assemble right before eating and enjoy. I know you are going to love these wraps as much as we do. Can’t wait to hear what you think! 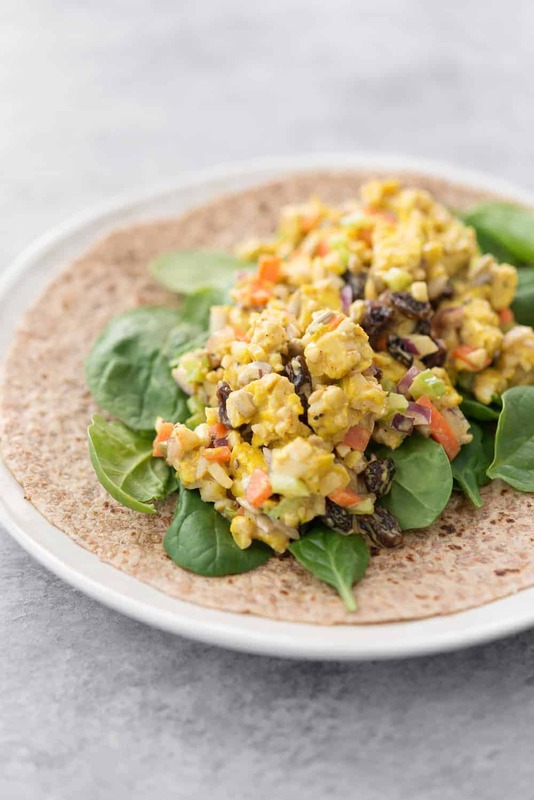 Vegan Curry Tempeh Salad Wrap! This plant-based sandwich is SO good! Curried tempeh salad with raisins, sunflower seeds, carrots, celery and more. So good, a must try, perfect for packed lunches. Whisk together 1 teaspoon curry powder with vegetable broth and whisk until dissolved. Add the tempeh strips to an 8×8 glass baker, and cover with the curry broth. Bake for 25 minutes until tender, then let cool and roughly chop. In a large bowl, whisk together the mayo, apple cider vinegar, remaining curry powder, turmeric and pinch salt/pepper until well combined. Add in the celery, carrot, onion, raisins, sunflower seeds and tempeh. Toss, seasoning to taste with more salt and pepper as needed. Place on wraps with salad greens and roll! Thanks again to Angelic Bakehouse for sponsoring this post!